The attempt may have been quixotic, and there’s little possibility of Ullah getting another shot at jihadist fame. But he is representative of a new generation of young militants from Bangladesh — one that calls not for jokes, but for serious scrutiny. Ullah’s attempt gained widespread media attention in the West because of its location: New York City. But a look at the trend of Islamist terrorism in Bangladesh will show that he isn’t the only one who’s tried the fedayeen format in recent times. He’s in fact part of a growing tribe of martyrdom seekers that has been emerging since 2016. Bangladesh isn’t new to violent Islamist militancy. Apostates, minorities, secularists, and freethinkers have been regularly killed in large numbers and with impunity. But until 2016, all of the violence had been restricted to their home ground; nothing was attempted overseas. Even large Islamist terror groups of the previous decades, the Harkat-ul-Jihad-al Islami Bangladesh for example, had been homegrown outfits. They shared training links with Pakistan-based Kashmir-centric outfits like Jaish-e-Mohammed and Lashkar-e-Taiba, and they also received funding from overseas. But both their membership and their political goals remained focused on Bangladesh. The only notable exception was when a small splinter group, the Asif Reza Commando Force, attacked the American consulate in Kolkata in 2002. That was made possible solely due to the porous borders between India and Bangladesh and this specific group’s deviance in the otherwise uninvolved organized crime network of the city. In 2013, Bangladesh saw a massive spike in Islamist violence. Led mostly by Hefazat-e Islam, Jamaat-e Islami and its student wing the Islami Chhatra Shibir, that year saw over 800 people killed or grievously injured. Even then, none of this violence spilled out of the national borders. For the new generation, the purging of minorities and infidels, or even anti-India positions, took a backseat. The injustices of Iraq and the dream of building a Caliphate in Syria were what inflamed their passions. The Islamic State replaced al-Qaeda in Indian Subcontinent (AQIS) as the brand to which they’d hitch their jihadi carts. This organizational change coincided with an attitude shift toward fighting. Where Islamists of previous decades had been content with killing in the name of religion, the millennial militant wants to die for it. According to cooks taken hostage, Nirbas Islam and his team, who took over the Holey Artisan Bakery in July 2016, had come ready to die and had no plans of surrendering. When breaking their Ramadan fast, the attackers joked with their hostages about their next meal being in heaven. Notably, Nibras and his team posed with the black flag of the Islamic State before attacking the eatery. Ever since Holey, an obvious death wish has been writ large on major terror-linked events in the country. March 2017 saw two more suicide attacks – one at the Rapid Action Battalion’s camp and another at the Dhaka International Airport – within the span of a week. Both were claimed by the Islamic State. Like the Orlando Pulse nightclub shooter Omar Mateen, the San Bernardino attackers Syed Rizwan Farook and Tashfeen Malik, and the Holey Artisan Bakery attack leader Nibras Islam, Ullah being named as the bomber led to reactions of surprise. She had spoken to him on the phone just before he set out on his attack. He said he was off to work, like any other day. Much of this surprise flows into news coverage, as outlets regularly express shock and surprise at the profile of the attacker. This surprise is perhaps more a result of the existing stereotypes of what a terrorist looks like, or where a terrorist comes from, than an informed opinion. Modeled after the Afghan Mujahideen and thereafter the Taliban, a terrorist, in most Western portrayals, is still a madrassa-educated ignoramus and religious hothead from an underdeveloped country who takes up arms to protect his ultra-conservative and theocratic lifestyle. This is at best an ill-informed yardstick with which to gauge potential terrorists and at worst a result of deeply ingrained xenophobia about the “Muslim look.” Facts paint a different picture. Like Tamim Chowdhury, the operational head of the Islamic State for the Bengal region who masterminded the Holey attack, Ullah came from a background of relative affluence and privilege. Ullah’s family, a landed one, left their ancestral home in the village of Muchapur in South Bangladesh and moved to Dhaka when he was just a baby. In the capital city, Ullah first studied in Kakoli High School and then did his junior college at the famous Rifles Public College. Thereafter he enrolled in Dhaka City College, pursuing a bachelor’s in business administration. Somewhere between 2010 and 2011, the family moved to the United States and became permanent residents. Unlike fanatics of past decades, the new attackers aren’t schooled in madrassas imparting religious education. 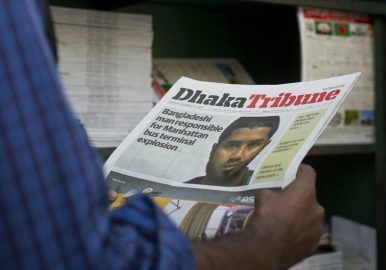 Instead, similar to iconic Islamic State militants like Muhammad Jassim Abdulkarim Olayan al-Dhafiri (aka Jihadi John) and or Siddhartha Dhar (aka Abu Rumaysah al-Britani), these young Bangladeshi men hail from well-to-do families and have had access to expensive English language higher education much of their lives. Most have lived overseas for extended periods of time and have had direct exposure to Western culture and liberal values. Nibras Islam, for example, was educated at the elite Monash University in Kuala Lumpur and many of his fellow attackers had traveled overseas on multiple occasions. Tamim Chowdhury was a Bangladeshi-Canadian with a Ph.D. Given the data from the last decade, the image of a typical terrorist is well past expiry. Furthermore, banking on that image either for law enforcement or for reporting is a deeply flawed practice. Following his arrest, Ullah said he was inspired by the Islamic State and was seeking revenge for U.S. air raids on Mosul. From investigations thus far, it is clear that he did not hold any formal membership or post with the Iraqi-Syrian outfit. In fact, he doesn’t even appear to have been in touch with Bangladeshi terror groups. This does not necessarily make him or his kind of attacker any less dangerous. The only known operative of the Islamic State in Bangladesh who actually traveled to Syria was the aforementioned so-called emir of Bengal, Tamim Chowdhury. Even the attackers of the Holey Artisan Bakery — the ones who posed with the black flag of the Islamic State — didn’t have any formal organizational contact other than Chowdhury. And yet the damage and death they caused was significant. Due to their proximity to the Pakistani military and intelligence establishment, older South Asian jihadist outfits — mostly Kashmir-centric groups like Lashkar-e Taiba and Jaish-e Muhammad — followed military-like command chains with handlers, trainers, and operatives. The new cells of younger jihadis, however, are far more decentralized, non-hierarchical, and reliant on the internet. This decentralization makes the Islamic State in South Asia operationally much cheaper than traditional outfits and allows the flexibility to quickly adapt to changing pressures from government forces. The reliance on the internet and messaging apps makes tracing and tracking much more difficult. In the wake of the infamous blogger killings, Tamim Chowdhury, then operating under his nom-de-guerre Shayk Abu Ibrahmi al Hanif, claimed the attacks for the Islamic State. “We are sharpening our knives for the apostates,” he boasted. The fact is, in a city ridden with petty crime and random political violence from all sides, it’s really difficult to pin a specific knife attack on a particular organization. So the merits of Chowdhury’s claim remains unclear. But even if untrue, this claiming of attacks worked well for both the Islamic State and those who carried out these acts. The former got to show off its presence in the region and the latter appeared larger than they were to their enemies. Providing propaganda, inspiration, and tutorials through shareable videos, audio sermons, e-magazines, and other digital content is the main trade of the Islamic State in South Asia. There is next to no coercion or monetary compensation. Individuals go from being the boy/girl next door to a terrorist almost entirely on their own effort. All the Islamic State does is provide a template to which vulnerable individuals mold themselves and content which inspires and educates. This has become a pattern of sorts in Bangladesh. For example, after Operation Storm 26 in Kalyanpur, one of the surviving militants — a cook for the nine-member team of 20-somethings — said the team had been preparing to join the jihad in Syria. Similar stories emerged when a cell of women terrorists was busted by the anti-terror police. In May 2017, acting on intelligence inputs, the Rapid Action Battalion conducted multiple raids across the Dhaka region and arrested young men of different groups like the Ansarullah Bangla Team, Hizbut Tahrir, and so on. All of these would-be militants were caught with laptops, jihadist literature, and bomb making materials or tutorials. All were reported to be in a state of preparation for joining the greater jihad. What the millennial Islamists are doing in the name of the Islamic State isn’t entirely new. Bangladeshi Islamists have always sought recognition in the jihadist hall of fame. For example, the leaders of the largest and most successful terrorist organization in Bangladesh to date – the Jamatul Mujahideen Bangladesh, active between 2001 and 2005 — openly boasted of their links to al-Qaeda. Even though proof is very thin, senior leaders and founder members claimed to have served alongside the Afghan Mujahideen in their 1980s fight against the Soviet Union. These links of the Jamatul Mujahideen Bangladesh to al-Qaeda or the Afghan Taliban were only as direct, or not, as those of Ullah and other millennial Islamists’ to the Islamic State in Iraq and Syria. And yet, based entirely on inspiration from international jihad and a burning aspiration to be counted among the best, they committed (or tried to commit) extremely violent acts against unarmed civilians. Moreover, the invocation of a bigger, global terrorist name made these individuals appear far more fearsome than they actually were and catalyzed their rise. At the peak of their success, Jamatul Mujahideen’s operational leader, Siddique ul-Islam, aka Bangla Bhai, declared a part of Bangladesh a Caliphate. The region was to be made independent from the country and its constitution, and run by Shariah, mimicking the Taliban regime in Afghanistan. Before being captured and hung, Bangla Bhai would also go down in history as the first to attempt serial and suicide bombing in Bangladesh. On August, 17, 2005, 500 bombs planted by the Jamatul Mujahideen went off across Bangladesh. Thereafter, he had one of his operatives blow himself up in a courtroom. Bangla Bhai’s bombs didn’t really do much direct damage — while more than 100 were injured, the blasts caused only two deaths. But Bangla Bhai was trying new things and breaking new ground, building on every little success and half-victory he got. The success also led to other small armed groups joining him and leading to a sudden growth in his group’s membership in a very short time. Bangla Bhai had a killer’s attitude and motivation. All he lacked was better training, some more funding, and just a little more time. He was arrested in March 2006 and hanged a year later. Ullah’s case isn’t very different.